During my teen years, wedge shoes - and especially wedge sandals - were THE thing. They were also called platform shoes. Of course I loved these, even though I wobbled a bit wearing them! It's interesting to see how fashions in clothes and shoes change and evolve over the years. The wedge has gone in and out of style several times in the past decades. 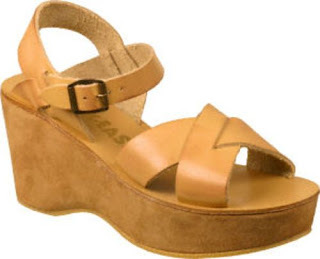 This was the quintessential wedge sandal during my teen years. It had a wood sole. Some of these sandals had cork soles (nice and light to wear) or rope (cute but not durable in rainy weather!). 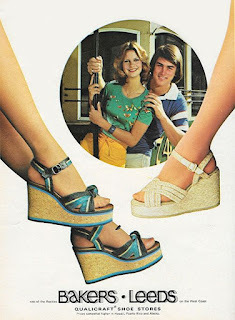 Do you remember wedge shoes from retro years? Or perhaps more recent versions? I'd love to hear from you in the comments, below. They are my go-to shoe in the summer. i love how comfy they are!! I am able to get my heel and height without stumbling over myself or rolling an ankle. So thats kinda the cats meow if you ask me! I used to LOVE my wedge sandals! I had a pair of the wooden soles w-a-y back in 1971. I still think they're so pretty when I see them on others, but they wouldn't be comfortable for me anymore at this age. It's a GREAT memory though! My older sister had a pair, and she LOVED them. I had a pair of Candies (I think), and I wore them occasionally, but they weren't my favorite shoes. I've always chosen comfort over fashion, even when I was a skinny teenager. Both my mom and grandma kept a few pairs of wedges for me to play dress-up with when I was a kid. Now, I want to wear them for real. Love them! Thanks all! I appreciate your visits and comments. Fun to read your memories of these shoes too. Oh, this makes me remember all the old Famolare ads from Seventeen magazine. Sadly, my mother never would get me a pair! I remember those ads in Seventeen!